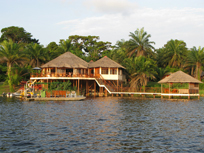 In mid July 2010, Africa’s Eden and its sister company SCD Aviation announced the closing of Loango Lodge in Gabon as per September 1, 2010. This decision was made as a result of an ongoing dispute with the Gabonese Aviation Authorities. It seems that this complex problem will come to an end. SCD Aviation has held intensive discussions with the Gabonese government to find final solutions. It is hoped that Loango Lodge can be re-opened in relatively short time. Keep updated about this information by checking our website regularly.